From left, Ignacio High School athletic director Rocky Cundiff, Avionne Gomez, Allisianna Baker-Marquez and IHS girls basketball head coach Trae Seibel pose for a photo after Gomez and Baker-Marquez signed National Letters of Intent to play basketball for Johnson & Wales University on Monday at IHS. 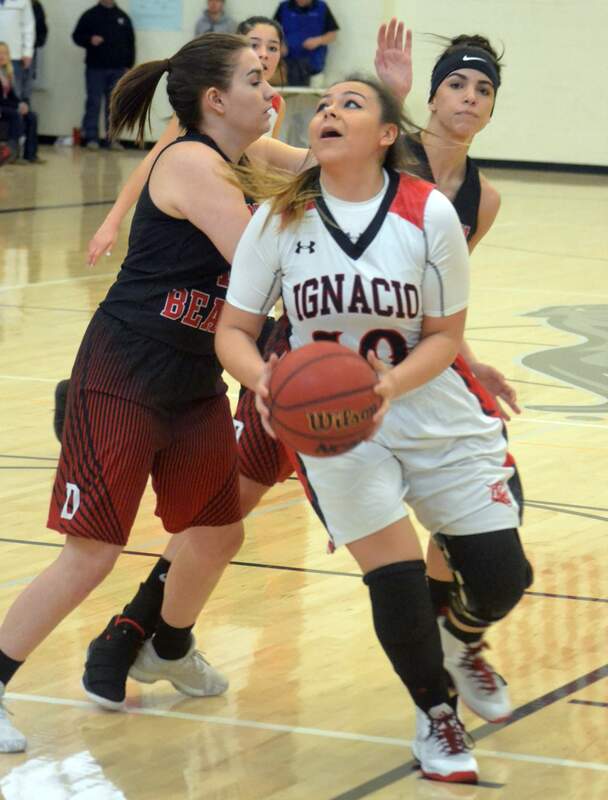 Avionne Gomez of Ignacio High School drives the ball while playing Sanford High School during the Region 8 basketball tournament on March 2 in Ignacio. Ignacio’s Allisianna Baker (10) angles herself into shooting position against Bayfield’s Madison Wells (14) on Jan. 9 in Ignacio. A pair of Bobcats are set to invade Denver this fall. 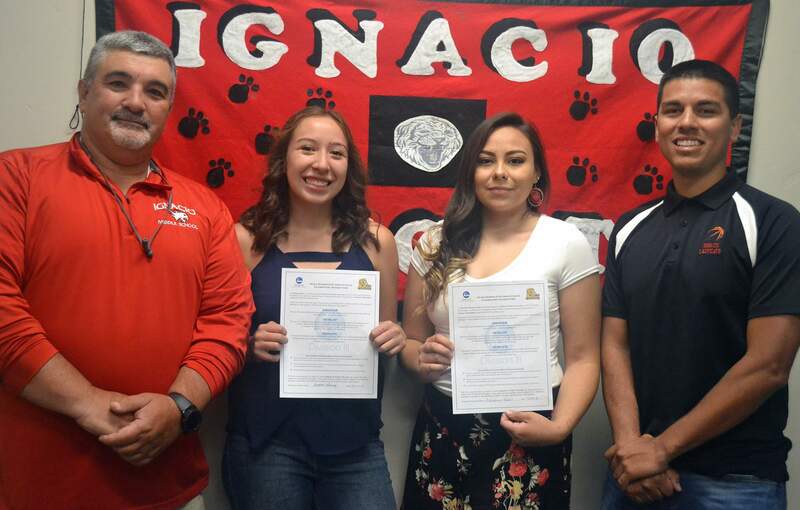 Ignacio High School’s Allisianna Baker-Marquez and Avionne Gomez will keep their basketball careers going after the duo signed National Letters of Intent to play basketball for Johnson & Wales University during a signing ceremony Monday at IHS. J&W has competed in the NAIA’s Association of Independent Institutions the past several years but is set to join the Southern Collegiate Athletic Conference for the 2018-19 season. The Wildcats went 5-17 overall and 1-7 in conference play during the 2017-18 season under second-year head coach Bob Kintzel. Gomez, who tied the Colorado state record with 10 made 3-pointers in a game as a junior, led IHS with 16.5 points to go with 3.9 rebounds and 4.6 steals per game as a senior. Avionne Gomez of Ignacio High School signed a letter of intent to play basketball for Johnson & Wales University on Monday at IHS. Gomez led the Bobcats with 16.5 points per game last season. 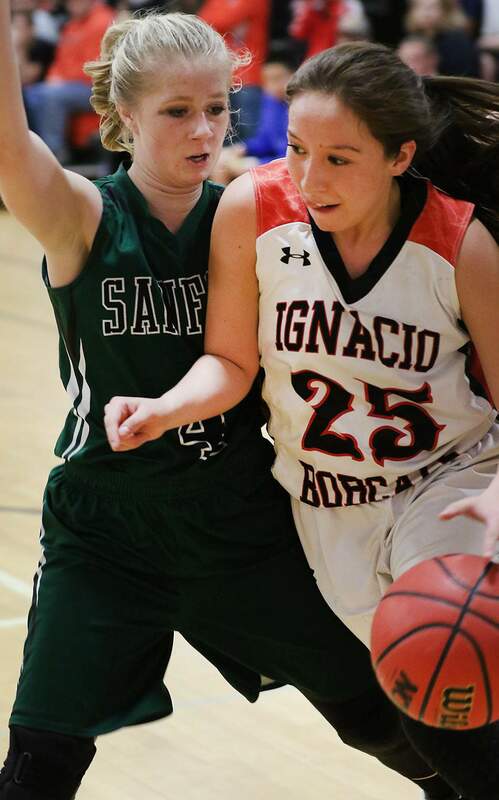 Baker-Marquez, who came off the bench last season, averaged 6.3 points and 3.8 rebounds for IHS. The two Bobcats took a bit different routes to their scholarship offers from the Wildcats. 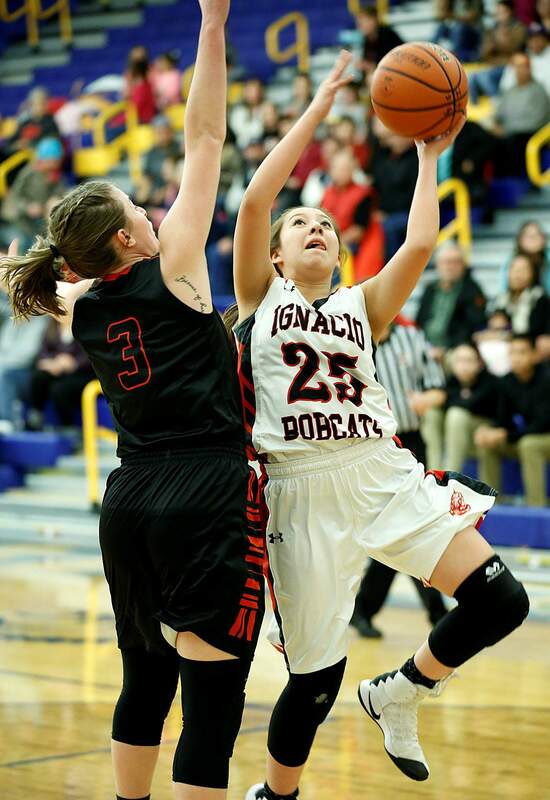 Gomez drew the attention of the Wildcats’ coaching staff during the Colorado Coaches of Girls Sports All-State basketball game in March. After the game, one of the coaches approached Gomez about playing at J&W. Baker-Marquez’s path to the Wildcats wasn’t as simple. Seibel talked to the post player and asked if she wanted to play at the next level. Knowing Gomez was taking a visit to the campus in Denver, he reached out to the J&W coaches, gave his pitch for Baker-Marquez and asked them to give her a tryout. The Wildcats were excited for another recruit and asked Baker-Marquez to join Gomez on her visit. “When they went up on April 30, I messaged both of them that night and they told me that they’d both got offers to play,” Seibel said. Allisianna Baker-Marquez of Ignacio High School signed a letter of intent to play basketball for Johnson & Wales University on Monday at IHS. 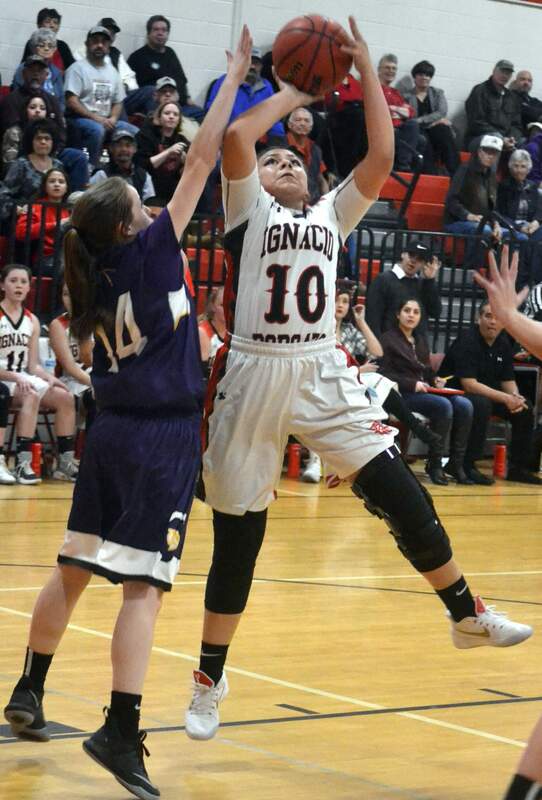 Baker-Marquez battleed her way back from two ACL tears to earn a scholarship offer from the NAIA program in Denver. The offer was a bit of a shock for Baker-Marquez. Gomez is expected to see playing time as a true freshman, while Baker-Marquez’ status is up in the air entering her freshman season. Both plan to major in psychology and believe having each other at J&W will help the transition to the college classroom and basketball court. The scholarship offer from J&W also helped erase the pain felt from a long and injury-plagued high school career for Baker-Marquez, who tore the anterior cruciate ligament in her left knee as a freshman, then again in the season opener of her junior season. “I never thought I would make it this far,” Baker-Marquez said.